In the midst of conquests and great expeditions, with carriages and ships as means of transport, a prodigious mind dreamed of a world that was to come. Inventions that today serve to traverse the skies or submerge us in the sea were already in the head of Leonardo da Vinci (April 15, 1452 – May 2, 1519), the Renaissance man. The illegitimate son of an Italian nobleman, from childhood he was interested in drawing, which he would never give up, as well as philosophy, architecture, engineering, anatomy, botany and everything that aroused his curiosity. Domenico Laurenza has spent several years studying the works of the Italian inventor from a scientific and artistic perspective. The historian, who works at the Galileo Museum in Florence, Italy, explains to OpenMind that “Leonardo’s point of departure was to imitate nature in a painting, a sculpture or a machine,” and has written several books on the scientist. Leonardo’s attention was always drawn to the flight of birds and he was obsessed with the idea that the human being could come to imitate them, as expressed in his numerous sketches. After several years studying the characteristics of air, the inventor thought that if it were compressed, it would be possible for a machine to be suspended in it. 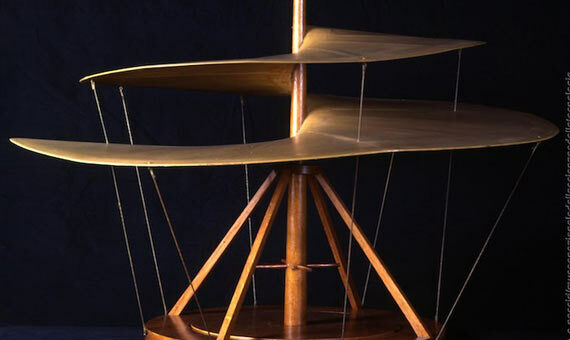 From this thought he conceived his aerial screw, considered the forerunner of the helicopter. The aerial screw in the Museo nazionale della Scienza e della Tecnologia “Leonardo da Vinci”. Credit: A. Nassiri. Until that date, around 1486, according to Laurenza “there had been no precursor” of the air vehicle that we know today. It would take almost five centuries for Leonardo’s idea to become reality. His sketch shows a machine composed of a central pole and some spokes on which was placed a helical structure of iron and a cover of starch cloth. From the base, the mechanism would be turned either with human force or with a cable, like a spinning top. Neither the aerial screw nor many of his inventions could be put them into practice due to the absence of the necessary technology. “He especially lacked light-weight materials to build the flying machine [one of the precursors of the plane],” says the Italian historian. 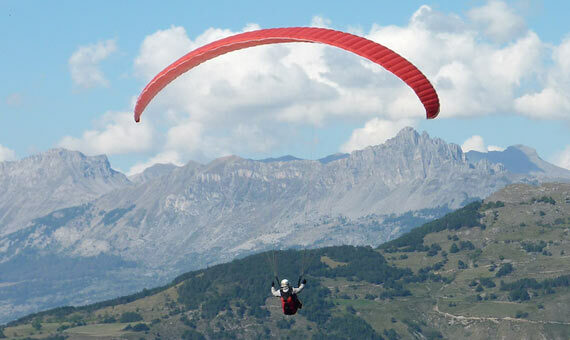 In 2000, British skydiver Adrian Nicholas launched from a height of 3,000 metres equipped with a paraglider similar to the one devised by the Italian inventor. The brave volunteer suffered no injury, and those who were able to watch his flight—curiously, from a helicopter—described it as “beautiful.” However, to avoid any incident, Nicholas triggered a second parachute around 600 metres above the ground. Leonardo lived in Venice for a long period, where he worked as a military engineer to protect the small republic against a possible naval attack from the Ottoman Empire. The Florentine inventor gave free rein to his imagination and devised an endless array of combat devices, including the diving suit. “In fact, there had been previous designs from other engineers of the fifteenth century, like Francesco di Giorgio,” points out Laurenza. This peculiar diving suit was composed of a leather jacket, pants and a mask with crystals to be able to see underwater. Inside the leather jacket, a leather bag with an iron structure contained the air supply. As Leonardo thought that the diver would have to remain submerged for a while, he even devised a recipient for urine, as appears in the Atlantic Codex, a collection of twelve volumes with his drawings and writings. His passion for the physical laws—which governed his engineering projects—reverberated in disciplines such as physiology. “Of particular interest to us are his contributions to bioengineering and how he used his knowledge of basic physical principles to shed light on the physiological function,” says John B. West, a researcher in the Department of Medicine at the University of California San Diego (United States), in a recent article. A drawing by Leonardo da Vinci shows the movements made by biceps (c. 1510). Credit: Wikimedia Commons. 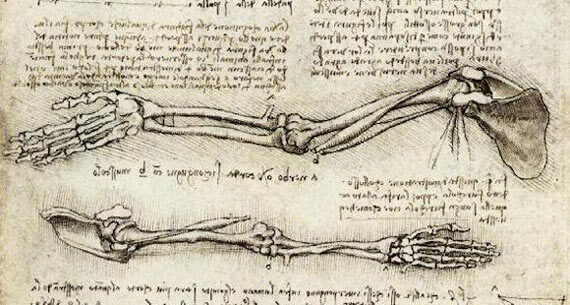 In addition to his contributions in the field of anatomy, with numerous drawings on the human body, Leonardo brought new insights into the mechanics of breathing, including the action of the ribs and the diaphragm. He also understood the functions of the internal and external intercostal muscles and studied how air circulated in the airways, not to mention the cardiovascular system. After all, what is the human body if not a perfect machine?